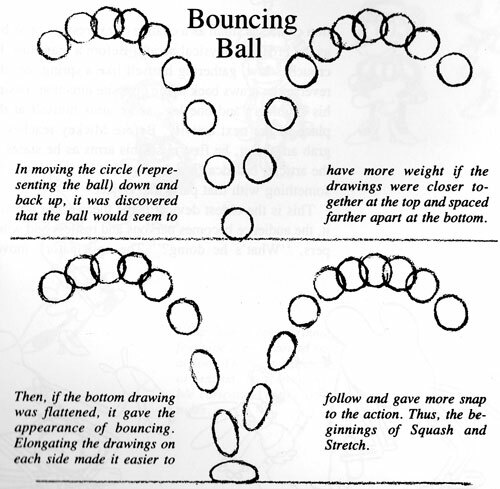 Do the bouncing balls consistently convey their individual properties? Are the arcs of the bounces parabolas with the apex at the proper location? Does the Squash and Stretch follow the tangent of travel of the ball? Are you effectively using the principles of Timing, Ease In/Out, Arcs, and Squash & Stretch? We've talked about the relationship between distance, speed and time. Because these balls are the same size, we can only distinguish their different material properties with timing and ease in/out. Squash and stretch will also play a role, in the next module. I realized this plan has some flaws (I underlined them in red). At least with sketches, it's very fast and easy to make mistakes. Looks like I need a new plan if I'm going to meet all of my criteria. Back to the drawing board. 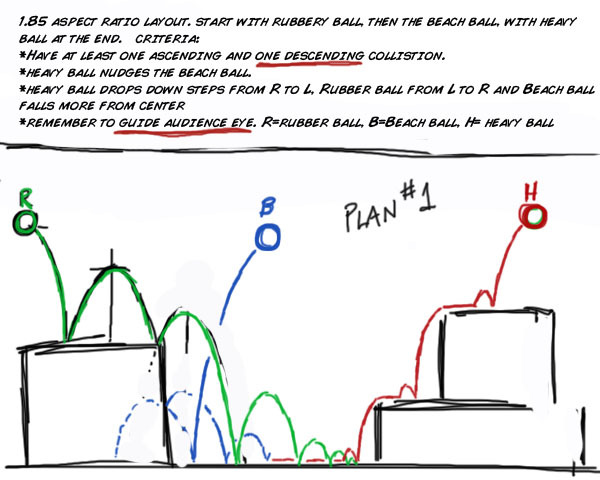 This plan is a bit better - I've also noted along the green ball path when other balls start moving. It would take a lot longer to work out these issues if I just dove headfirst into Maya and started animating without a plan. These doodles took me about 15 minutes to make. Yay planning! Here's the first pass with just the arcs and timing worked out. Each ball should have a distinctly different sense of mass and material. After review in class, you should have a better idea where you can improve on your work. Arcs are asymmetric/not a smooth parabola. Timing issue, accelerating or decelerating at wrong time. Timing issue, moving too fast. Timing issue, moving too slow. Not enough acceleration at bottoms of arc - timing too floaty. Too fast at bottom of arc, causes "strobing". Bouncy ball sticks too much at bottom of bounce. Note that the ball doesn't squash at the apex of the bounce (or it would look like jello). Also take note that the biggest stretch pose is immediately before and after the squash. Don't forget that the long axis of the stretch is along the path of the ball, essentially pointing in the direction of travel. 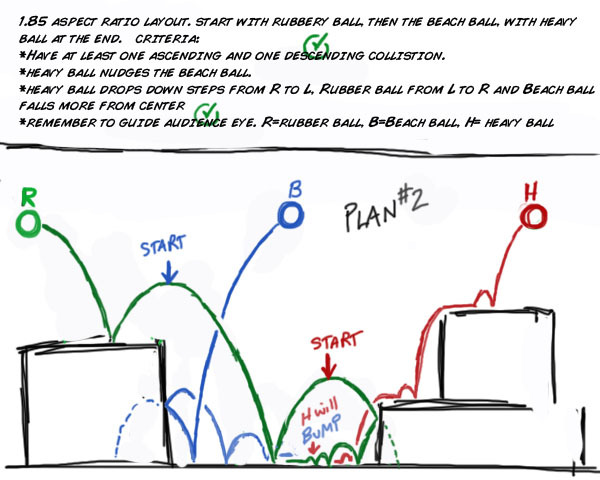 Here's my second pass with squash and stretch added to the bouncy rubber ball (and a bit to the beach ball.) The heavy ball does not deform, to support the idea it is rigid and hard. Based on review in class, make any fixes needed to ensure your work is the best quality you can achieve. Review the list at the top of this page "What I'll be grading on this assignment". Your priority should be to have all those items working well.